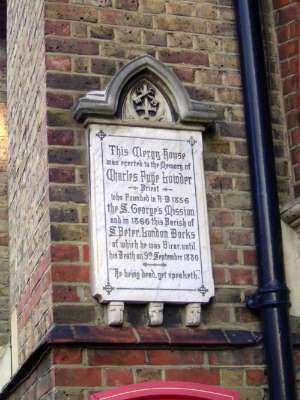 A monument on the well of the clergy house recalls the founder of the church, Charles Fuge Lowder (1820-80). As a student at Oxford, Lowder heard John Henry Newman and decided to become a priest. A decade after ordination, he became a leader of the group that created the Society of the Holy Cross, dedicated to social service in the form of St. George's Mission to the East, meaning not India but East London. Land in Wapping was acquired for a church, and about a decade later St. Peter's was consecrated. The next day, cholera broke out in the neighborhood. Because of his service during that crisis, Lowder became known as Father, the first Church of England priest to be so addressed.